Write a Resume in Minutes: Can You Make a Compelling Piece? 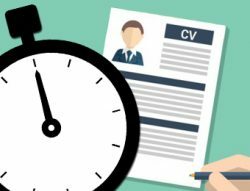 Can You Write a Resume in Minutes? Of course. But you cannot compose an outstanding one in such a short span of time. If you’re another job applicant who is searching for a quick fix in your application, you’re on the wrong site brood. And we doubt if you’ll probably get a decent advice on what you’re looking for. The problem with fast resume solutions is that it doesn’t pay off. Yes you may save time, you may save effort, but God knows if it will generate even just a bit of result. Imagine a thousand competitors recycling the same cliché words and phrases over and over again. Your jaded HR certainly won’t be amused looking at one that contains all that is passé. Not unless he loves listening to proverbial broken records, he won’t lift an eyelid for your self-advertisement. The only way to ensure the attention of the person who will read it is to be faithful in weaving your own unique words and portraying your own unique abilities. There are many ways out there to craft a copy that will highlight why you should stand out among your hundred competitors, but passing an application made out of the cookie cutter will definitely be one way to fail. Remember that there is no such person who can talk sense as quick as he pushes his pen. You have to think of what you’ll put as a content, you have to segregate nonsensical from not, and most of all, you’re limited to two pages. Plus, consider that the buffer time of staring into the blank screen before you write (which will take you fifteen minutes or more if you’re not a robot). Plus, you have to count off the processing time when you’re thinking on how to word your competitive edge. That’s already a pretty big fraction of your time limit if you’re vying to write a resume in minutes. Did we say review? You must do it if you want to ensure that your paper won’t end up in the trash bin because of spelling and grammatical errors. You cannot rush into the HR office without even taking a rain check on whether you printed the lay-out right or whether your copy is free of typographical mistakes. Remember that the last thing you want the employer to think about you is the impression of a lackadaisical person who will definitely commit a lot of blunders when hired for the job post. And this is just an informative composition that has nothing to do with my life and achievements. I don’t have to recall my accomplishments or mull over how I will impress the one who’s reading this. But guess, it took me an hour and a half before I could pass it to my boss. And people are asking if they can write a resume in minutes? No dice.